But I keep standing there, waiting, because all the evidence suggests the site really is haunted… perhaps dramatically so. The problem is, ghost hunting can be like waiting at a street corner for hours, hoping to see a green, 1964 Ford Mustang. And your only evidence is that – over the past 20 years – lots of people mentioned seeing one pass that street corner. Whether you actually see a ’64 Mustang – or think you do – may depend on how long you stand there. In paranormal research, I think we need to expand our horizons. Explore offbeat theories that might lead us to something useful. I mean, really, we’re already delving into topics many people consider too “out there” to take seriously. Why not go all-in, and see where the fringes take us? Start with speculation, test it, follow-up with brainstorming, and extract the most promising elements. Amplify those to see what happens. Repeat. But where can we find fresh speculation? Where are the fringes? Well… that leads to an article I read. It connected art with a sort-of paranormal headspace. Are you ready to go way out on a limb, into speculation…? Here’s the link that started today’s “what if?” musings: Susan Hiller, Conjurer of Paranormal Activity Through Conceptual Art, Has Died at 78. Would it work? Maybe. I have no idea. I’m not sure whether her goal was more than slightly shifting viewers’ headspace. Many creatives have expressed something similar as a figurative reference. I’d love to know how literally Hiller meant that, and how it fits with specific art installations. In the past, I’d read about Raudive, but hadn’t followed-up to learn more. What Are We, and What Are Ghosts? That reminded me of one of Vivek Narain’s comments on a recent trends article. He mentioned holograms, and – as usual – suggested several unique ways of looking at paranormal activity. To me, his observations resonate with Hiller’s “we are pixels” explanation. It was interesting synchronicity. I’m not sure if anyone else follows the connections I see between Hiller’s concepts, experimental work by Raudive, Vivek’s comments, and my research which spans many apparently distinct fields of study. I believe we need to explore how, when, and where we encounter paranormal activity. We should always question whether there are better research techniques. After all, standing around in a “haunted” site, waiting for something to happen… it may not be the most productive use of our time. I’m not sure how far out on a limb we should go, with research techniques. Do we go more electronic, or back to “old school” ghost hunting methods? What about creating environments – as Hiller and Raudive did – that might be more conducive to paranormal activity? Today, I have no answers to this. Not even a clue. But, I applaud Hiller’s work and hope to see some if it in real life, in the near future. I might try some EVP recordings around it. And, I’d be intrigued if her installations resonates – no pun intended – with how we feel immediately before and during a paranormal encounter. Maybe there is an access point to those experiences. I’m not sure we can deliberately create it, or if it would be safe to try to. For now, the Hiller story and the Raudive recordings are the kinds of breadcrumbs I watch for. If this seems like nonsense, that’s fine. I grew up in the halls of MIT. I spent countless happy hours, playing with strobes and other toys in Doc Edgerton’s lab. That was my childhood context, and – even now – it’s part of who I am. But, if anything in this makes sense to you, or you can put more of this puzzle together, I’m interested in your theories. Sometimes the “what if?” questions lead to the most fascinating answers. 2019 looks like a good year for ghost hunting events, tours, and vigils. In my previous article, Ghosts & Paranormal Trends – 2019, I described general trends. 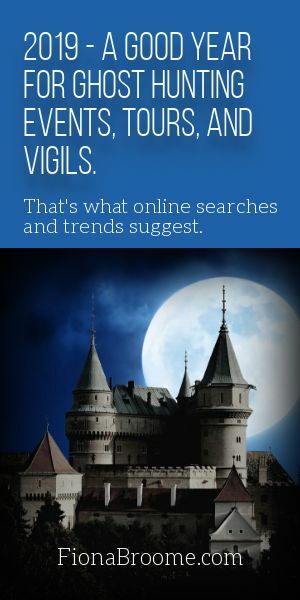 In this article, I’m focusing on Google search trends – for “ghost hunting” – in the US and the UK, to see what fans and researchers are looking for. Summary: In the US and the UK, an increasing number of people are interested in encountering ghosts, themselves. In the US, they’re interested in ghost hunting equipment & how it works. UK fans have maintained a steadier interest in ghosts. In the UK, people are looking for ghost hunting events, especially when they can learn from pros, and test-drive ghost hunting equipment, themselves. In both countries, to reach wider audiences, TV shows and events could include ghost hunt pros (as “invited guests”), and share how-to sidebars, information, or workshops. Here are the trends, as I see them. In the US, ghost hunting enthusiasts seem most interested in ghost hunting on their own. Events and tours (and TV shows) can make the most of this by including how-to information. And, in the case of events & tours, letting visitors borrow ghost hunting tools. In the UK, people are looking for ghost hunting events, sometimes with specific people. They’re also looking for ghost hunting equipment, and shops that sell them. Here are the graphs from late January 2019. First, “ghost hunting” searches in the US, since 2004. I’m not sure if interest has stabilized or is increasing slightly in the past six months. Here’s a five-year US graph for “ghost hunting” Google searches. I think the 2015 spike can be attributed to Paranormal Activity: The Ghost Dimension (2015). Also, I think the 2016 decline may related to the announcement that Ghost Hunters’ TV series had been canceled. (Last episode was Halloween 2016.) I think that announcement was a social cue that – in the network’s opinion – the ghost hunting trend was over. That may have been a self-fulfilling message/prophecy. Here’s that same search (“ghost hunting”) for the UK, since 2004. There, it looks more stable over a longer period of time, and perhaps declining slightly since early 2013. Here’s that same Google UK search graph – “ghost hunting” – since early 2014. To me, the past five years look fairly stable, with a downturn after Halloween, but an uptick with the new season of “Most Haunted” and other shows. Next, I looked at “ghost hunting events.” What I saw surprised me. Google had no graph for that term in the US; there weren’t enough searches. But – interestingly – the areas where Americans search for “ghosts” and “ghost hunting” were places hosting ghost hunting events around the time of the search. So, though those searches may reflect recently aired TV shows, I think Americans are less likely to add the word “events” when they’re looking for… well… a ghost hunting tour or event. By contrast, “ghost hunting events” regularly appears on Google’s “breakout” searches lists for the UK. Here are the UK graphs for “ghost hunting events” searches, starting with the 2004-2019 graph. In the UK, those searches have been increasing since 2017. Americans should pay attention to this. In my experience, British ghost hunting enthusiasts are often one step ahead of American trends. That’s what the graphs have indicated since I started tracking ghost hunting interest, around 2004: First, UK searches climb or even reach breakout status. Then I see those same kinds of topics/shows trend in the US. Finally, here are some comparisons among related searches. They’re of less value. Some “paranormal” searches may need to be discounted due to searches for movies like Paranormal Activity. The UK graphs show the same Halloween trends, but a sharper drop in interest for the simple search. But, “ghosts” significantly out-performs “paranormal.” That’s the reverse of US trends. In related, breakout search terms, the US and the UK were somewhat different. Despite that, I think they point to a visible trend towards personal ghost encounters, at ghost hunting events and tours, or as part of independent teams. Yes, the US shows more interest in ghost hunting TV shows. 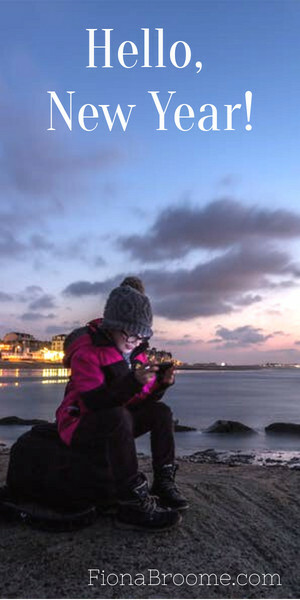 But, the prevalence of interest in ghost hunting apps, tools, and equipment also suggests a growing popularity in personal ghostly encounters. Of course, ghost hunting TV stars – British and American – draw the largest interest. And, in the US, shows may benefit from including segments explaining ghost hunting tools and techniques, with how-to advice. Likewise, I’m seeing a growing interest in US events featuring stars of past ghost hunting shows, including Ghost Hunters (and Ghost Hunters International), Paranormal State, and Ghost Lab. 2019 may be a good year for ghost hunting. I won’t pretend that I see massive upticks in any single trend, at this time. But, if you consider the graphs and breakout searches, I see potential for a new – perhaps younger and more analytical- audience. They could spark a new wave of enthusiasm for ghost hunting shows and events, and haunted sites that are open to overnight stays and tours. What are your thoughts about this? After studying these trends for nearly a month, this article and my previous one are condensed overviews. I’m happy to answer questions or consider alternative opinions. Please leave comments below. Revise & update my books. Update & expand my free ghost hunting courses. Publish more articles, more regularly. Spend more time interacting with friends & fans via social media. Decide what to do with the Mandela Effect topic. Hmm… which of those did I complete? I did write a few articles, and start a Fiona Broome News page at Facebook. I even updated it, now & then. Other than that… crickets chirping… Nope, nothing. They were fun, but they didn’t move me closer to my short- or long-term goals. Now it’s 2019. My goals are the same, but my approach is different. Fingers crossed, I’ll achieve more goals, this year. I’ve discovered that Scrivener and ProWritingAid play well together. I’m using both, and hope to finish updating Is Your House Haunted? by mid-February. After that, I think I’ll edit & update Ghosts 101 or Ghost Hunting in Haunted Cemeteries. At the moment, it’s a coin-flip. So – in terms of the books – so far, so good. New articles at HollowHill.com, every Thursday. New articles here, usually on alternate Tuesdays. Again: so far, so good. I’ll probably scale that back a bit, in the next few weeks. The Mandela Effect book is an on-again, off-again project. I’m not sure how much I can say that will interest anyone. Really, that topic took on a life of its own, and – at this point – it’s been “in the wild” for years. I suppose I have bragging rights for starting the Mandela Effect discussions, online. And, I have lots of insights about its early days, but is that enough for a book? Maybe. I don’t have to decide that, right now. I’m making some progress, but stumbling a little along the way. See, I love Most Haunted. While so many other shows have become increasingly sensational, Most Haunted avoided that bottomless pit. They’re not afraid to try new things, even when those things don’t work as well as they’d hoped. They’re still breaking fresh ground… no pun intended. From what I’ve seen in 2019, Most Haunted episodes are steering towards authenticity. In many ways, that’s made the show more startling than ever before. Watching the Eden Camp investigation, I had no doubt that site is genuinely haunted. But after writing a couple of Eden Camp articles… I kept researching. And writing. And researching. And writing. Apparently, I’m addicted to history. Especially when it overlaps with paranormal research. So, instead of writing three or four 500-word articles about several Most Haunted episodes… I wrote five articles, most around 1500 words, each. About just one location. And then I illustrated all of them. That included about four hours, combining ten layers of research onto one map. 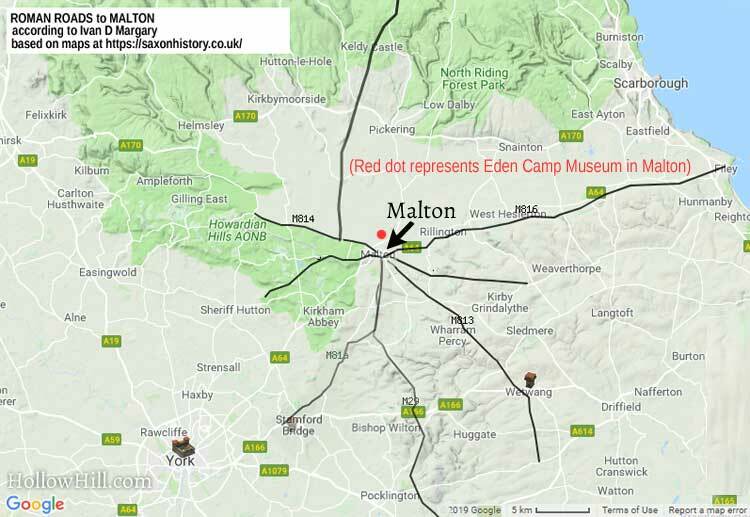 Because I just had to see all the Roman roads overlaid on a modern-day map of Malton, England. Umm… yes, I need to rein in those “ooh, shiny!” tendencies. Starting next week, I hope to schedule my time better. My social media schedule requires far more tweaks, but I feel good about my recent conversations at Twitter, etc. With my website articles on schedule, and social media doing better, revising the books is now my top priority. I’d love an excuse to move there by the end of this year. Meanwhile, I’m doing my best to stay focused on my goals. 2018 flew past, but I’m already making progress for 2019. You may see me wander into “ooh, shiny!” territory now & then. I’m sure there will be growing pains, as well. For now, I’m pleased with January’s forward motion. And I figured I should share this with you, in case you noticed things changing and wondered what was going on. So, let’s celebrate the new year. I hope everyone has a dazzling and delightful 2019! Does ESP affect paranormal research? It’s a question I’ve discussed with several people in relation to multiple topics, but especially ghost hunting. Poltergeists – Psychokinesis, or PK Plus an Entity? Many 20th-century ghost hunters believed that a living person was the source (or nexus) of the energy. But, was it that person’s subconscious wish to make the noises or move the objects? Or, was some kind of entity involved, as well? In my opinion, the latter is more likely, but I’m not sure how we could prove that. In history, one of the most famous poltergeist cases involved the Fox sisters. Many associate them with the founding of the 19th-century Spiritualist movement. No matter what the truth about the apparent activity around the Fox girls, their home had a long history of poltergeist activity. That’s why few tenants stayed there, even before the Fox family moved in. In The Ghost Hunter’s Guide, 20th-century paranormal researcher Peter Underwood wrote about testing during a ghost hunt. That’s an interesting thought, but I’m not sure what it would prove, one way or the other. I would like to see if – during ghost hunts – psychics test differently than they do in not-haunted locations. Again, it probably wouldn’t prove anything, but it might be intriguing. If the results were much better at the haunted location, something at the location – perhaps ghosts or paranormal energy – could be a factor. It’s important to consider the effects of ESP and psychokinesis (PK) in the Philip case, as well. Could all of that phenomena be attributed to ESP and PK? We may never know. Many questions come to mind. How much poltergeist activity might be psychokinesis (PK) instead of ghosts? If poltergeist activity is a two-part phenomenon – the spirit and the (living) energy source – does it matter whether PK is involved? If an historian is on-site during an investigation, how many psychics’ (and others’) “impressions” are actually mind-reading or ESP? In famous cases such as the Amityville Horror house, how much of the disturbance was contributed to, by the residents? The ESP-ghosts-psychokinesis-poltergeists knot is difficult to untangle. I don’t know how we’d even begin to separate these kinds of activity. I’m interested in your thoughts about this topic, and any way we could distinguish paranormal activity from psychokinetic abilities. Do Paranormal Researchers Attract Ghosts? Different things can spark an interest in paranormal research. For many people, it started with a childhood interest in ghost stories, or an experience that – as adults – they still wonder about: was it really a ghost? That’s why they go looking for ghosts, or evidence that proves (or disproves) their existence. But, now and then, someone asks me if ghost hunters live in haunted houses, or even attract ghosts. People want to know if we “take ghosts home,” or feel uncomfortable if we move into a house… and later find out it’s haunted. I’m not sure how many ghost hunters attract ghosts. On my New Hampshire team, one person – the one we called “ghostbait” – certainly attracted them. If he was part of an investigation and the site was haunted, weird things would happen. It was almost guaranteed. Of course, this is a chicken-or-the-egg question: Did “ghostbait” attract ghosts because he was a ghost hunter, or did he become a ghost hunter because he naturally attracted ghosts? At the other extreme, we sometimes included a friend who described himself as a “walking banishing ritual.” If he was within a dozen feet of an anomaly, ghostly activity would halt. The tragedy was, that latter friend was eager to encounter ghosts, and it rarely happened when he was there. 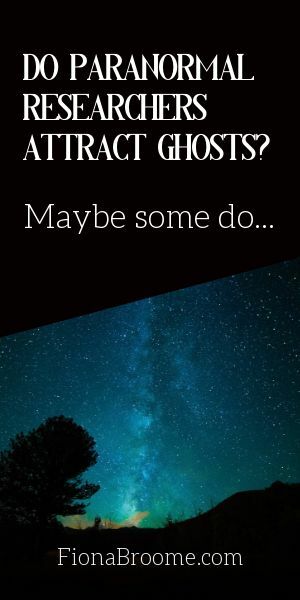 So, I’m confident that some people attract (and others repel) ghosts, naturally. In both cases, these people didn’t actively do anything to affect the ghosts. Can one develop those qualities? I have no idea. It’s possible that some experienced ghost hunters seem to attract ghosts, when they’re merely more observant. After a few dozen investigations, they know exactly what to look for, if the site is haunted. That could be a sense of where the ghosts are, at a particular location. It could be something they detect with their five (or six) senses. Or, it could be a personal reaction – a “gut feeling” – that the site is haunted. Some – not many – ghost hunters live in haunted houses. Usually, they’re happy to share the space with a benign spirit who once lived there. Some paranormal researchers aren’t so happy about that discovery. She finally called out to whomever it was, asking them to stop bothering her… and immediately, they stopped. All seemed normal again until she went to bed. Once the lights were out, the noise returned… but this time it was coming from the living room. Something — or someone — was walking through the house. Disturbed by the unseen intrusion, Roncace nevertheless does not want to know what’s causing it. However, Ms. Roncace is a reporter. At the time she wrote about her haunted house, perhaps she hadn’t investigated intensely haunted places. I understand not wanting to live with a ghost. It can be unsettling… no pun intended. But, as a homeowner, I’d definitely want to know more about the ghost – who’s causing that walking noise, and why. At the very least, it might help me become a better paranormal researcher. If they’re merely visiting, or keeping watch over the house – or those in it – that’s fine with me. So far, I’ve lived in three haunted houses. Only one had an annoying ghost; we remodeled the house, and he left. But, if I were house-hunting, I probably wouldn’t ask a realtor to show me haunted houses. A house with a documented history that supports its ghost stories. Let’s say the ghost is supposed be to haunted by one of King Henry VIII’s mistresses. I’d be certain the house – or at least the land it’s on – had a documented connection to that woman & her family. Ghostly phenomena that aren’t entirely poltergeists. Otherwise, when the previous tenants moved, they may have taken the poltergeist with them. A price that’s a little (or a lot) lower than the estimated value of the house. Most people think of a ghost as a “defect,” so the house should sell for less than it would without the ghosts. No malicious or sinister phenomena. No history of Ouija board use in the house, or rituals (however well-intended) that might summon a dangerous entity. Some paranormal researchers choose homes based on their eerie reputations or locations. For example, some UFO enthusiasts want to live near where UFOs are regularly reported. On the other hand, I don’t think I’ve ever met a cryptozoologist who wanted to live in a “triangle,” like the Bridgewater Triangle or the Bennington Triangle. And I don’t know anyone who’s chosen to live near a Hum or a Mystery Boom. 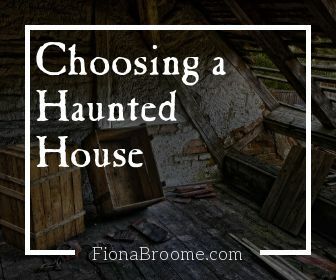 So, if you’re looking for a haunted house to live in, be sure the sellers understand the difference between hauntings and other paranormal phenomena… unless you’re okay with Bigfoot howling outside your window. What Makes a House “Suddenly” Haunted? Can a not-haunted house suddenly become haunted? Maybe. Ms. Roncace, the paranormal reporter, had lived in her home for nearly 20 years without evidence of ghosts. So, why did a ghost suddenly show up? Had she attracted one, or brought one home from a haunted site? It’s unlikely a ghost followed her home. It’s rare for a ghost to leave the site that he or she haunts. Hardly any ghosts follow people. It’s possible that something concerned the ghost enough to make his (or her) presence known. A good example is Ms. Roncace’s story about the ghost knocking on Ms. Roncace’s dresser, when her daughter was ill.
Also, poltergeist activity could explain the noises in the kitchen. The movie she was watching, The Omen, could have been a trigger. The footsteps she heard might have been more poltergeist activity, or something different. More likely, it’s a residual energy haunting. That phenomena was likely to stop after a week or two, or even sooner. It’s possible that Ms. Roncace attracted a ghost… but that’s unlikely. Most ghosts are trapped – or choose to stay – in the primary location where they haunt. And, if you’re a ghost hunter, it’s an asset if you can attract ghosts at haunted locations. Unless, of course, ghosts frighten you. In that case, it’s best to find another hobby. 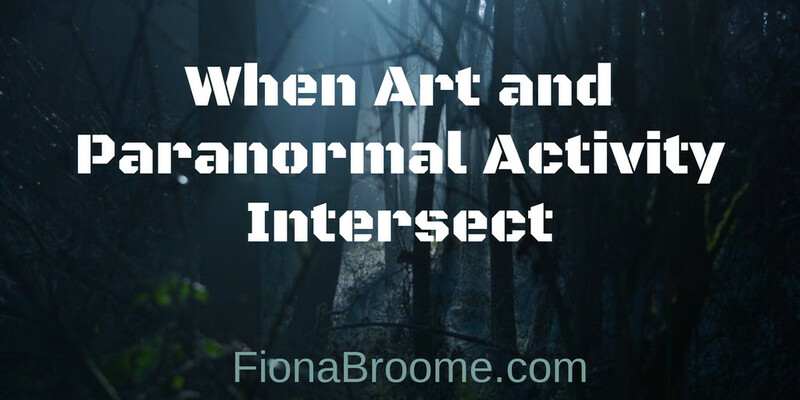 Author FionaPosted on January 8, 2019 January 5, 2019 Categories Blog5 Comments on Do Paranormal Researchers Attract Ghosts? What was that thing I heard/saw? And what if ghosts are real? Everyone says that house/battlefield/cemetery is haunted. What if they’re right? Ghosts can’t be real. I won’t believe in them. But what if something really is going on, at that “haunted” site? 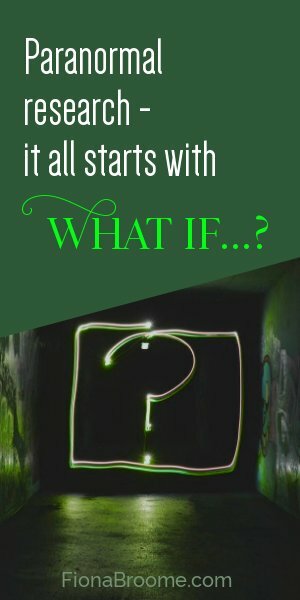 My “what if…?” questions seem to multiply, like wire coat hangers in the basement wardrobe. Or dust bunnies under the sofa. This morning was no exception. I had an idea for a new Hollow Hill article. It was going to be about one particular archetype in ghost hunting. I started to research the idea, based on a series of related, haunted places in the U.S. and the U.K. So, I’m sitting here, printing pages & pages of information about repeating patterns in this kind of research. I’ll put aside the book idea from this morning’s research. My next editing-and-updating project must be my “Is Your House Haunted?” book. Why? Well, there’s no way I can reply to all the emails from people asking if their homes are haunted. And, frankly, most probably aren’t… but some sound like they are. My book will help people rule out unusual (but normal) reasons a house can just seem haunted. I think most of this concern relates to the “The Haunting of Hill House” TV series on Netflix. That show is an interesting revision based on Shirley Jackson’s wonderful book, and what may be my favorite “haunted house” movie of all time, “The Haunting” (1963). Here’s a YouTube video from the original movie, featuring one scene. No, most ghost hunts and vigils aren’t even close to that dramatic, but many can be just as scary… in more subtle ways. Likewise, the Netflix “Hill House” series isn’t realistic. The tropes in it are fun, and it includes a few good scares, but that’s not what happens in haunted houses. At least half of the latest emails in my in-box sound like sleep paralysis. That is, the person thinks he (or she) has woken up – or didn’t fall asleep yet – and has been visited by a disturbing figure (usually a scary looking ghost). The victim usually feels paralyzed, cold, or numb… and terrified. The incident can seem to last forever, but – in actual fact – it’s usually just a few minutes. And then, the person is left with a sense of horror, a racing pulse, and pumping adrenaline. Sleep is difficult to resume, if the person can get back to sleep at all. The problem is, it can seem a lot like the ghost at the foot of the bed (or over the bed) in shows like Netflix’s The Haunting of Hill House. And that’s why people write to me. They want to know what if it’s real? What if it happens again? More important: I believe the “what if…?” impulse is a healthy one. It keeps us interested in the world around us – seen and unseen. Usually, those questions leads to simple, fact-based answers. The person sighs with relief. What they experienced was normal, not paranormal. But, sometimes that’s just the beginning, and further research leads “down the rabbit hole,” as in Alice in Wonderland. Either way, it’s important to keep your critical thinking skills engaged. And, in my case, it’s even more important to stay focused on my current projects. They include updating my websites and my books. That will keep me busy for much of 2019. But, I’ll confess that this morning’s research – and the connections I discovered, among iconic haunted houses – sings a siren song. I’m always intrigued by “what if…?” questions. So far, I’m resisting temptation. Note: When articles cross two or more topics I routinely research, I’m planning to post those articles at this website. It’s simpler than trying to choose one of my other websites… and risk selecting one that isn’t the best match. In 2008, when Armchair Reader: Weird, Scary & Unusual asked me to write a chapter about black shucks, I was delighted to share what I’d learned about those mysterious creatures. So, what are black shucks? Shucks have been reported for centuries. They’re not just legends. As recently as the late 20th century, police officers have encountered them. Most shucks are reported along England’s east coast, including the town of Cromer. The Cabell family (the basis of the Baskervilles, in the Sherlock Holmes story) has other ghost stories, but the black shuck may be the most famous. In Norfolk’s town of Overstrand, there is even a Shuck Lane where shucks have been seen. Shucks and eerie black dogs have been reported in Wales and Scotland, too. Often, those bridges have suicide stories, as well. So, though I’m sad (beyond words) to read the following news story, it may be important for paranormal researchers. Will black shucks appear there in the future? I’m not sure if I’d want to see – or even hear – one. 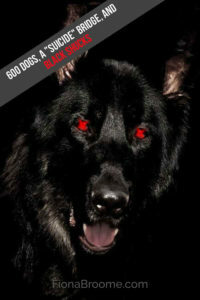 Is a Black Shuck a Ghost? I’m not sure a black shuck is a “ghost.” To me, it may fit better in the fae context, perhaps the Unseelie Court. Or perhaps it’s best categorized in cryptozoology. That may be the best answer. Also – as you’ll read in the following article – there are the other, actual ghost stories at this active location in Overtoun, Scotland. Be forewarned: this story is horrifying. I don’t want to sound like I’m trivializing how awful this is. As an animal lover, I hope they find an answer to this terrible situation, quickly. But, as a paranormal researcher, I’ve noted it for future investigation. Maybe nothing weird is going on. Maybe it can be explained by minks in the area, or something else. Frankly, I like that idea. It’s something they can fix. If you’re investigating around Overtoun, keep this in mind. Around 600 hundred dogs have attempted suicide from the Overtoun bridge in Scotland. And all the dogs jumped from the exact same point. Experts are baffled and are unable to explain the mystery. The bridge has a history of 160 years and has been responsible for the deaths of a specific kind of dogs: those with long snouts, such as German Shepherds, Labrador Retrievers and Scottish Terriers. A number of locals believe that the bridge as well as the Overtoun house is haunted by the spirit of ‘The White Lady of Overtoun’. The bridge is nicknamed ‘Dog suicide bridge’. Dogs have continued to leap from the bridge, and this strange phenomenon has gone unexplained since as early as the 1950s. He elaborates that there could be other factors…, one being mink urine. The mystery behind the bridge has attracted worldwide attention and supernatural theories have been proposed so far, some even calling it the ‘Thin Place’ where afterlife and physical world meet. Different theories have been put forward to explain the dogs’ bizarre behavior. However, there have been no solutions; the mystery bridge continues to claim lives of the dogs. A longer version of that post, 600 dogs have attempted suicide from the mysterious ‘haunted suicide bridge’ in Scotland, appeared first on Journal Post. Thank you, Coast to Coast AM! Tonight’s radio show was so much fun, I want to thank everyone involved. Of course, the show ran smoothly from start to finish, due to the high level of professionalism of the Coast to Coast AM staff, including Lisa, Stephanie, and Tom. I appreciate how easy they made… well, everything connected with the show. If there’s such a thing as a perfect radio show for people in my research field, I think Coast to Coast AM is it. I’m still smiling, and glad I had a chance to be on such a respected radio show. It was a wonderful experience. Author Fiona BroomePosted on June 19, 2018 Categories Blog10 Comments on Thank you, Coast to Coast AM! Here’s the latest, explaining why I’m still a paranormal researcher, and a little about what I do that’s unique. One of my main goals is to be sure that everyone who wants a paranormal experience, can have one. In this video, I describe some of the nuts-and-bolts of my work. That goal is why I keep fine-tuning my system of analyzing repeating patterns of odd, ghostly, and other paranormal events. With that information, I can often predict when & where people will encounter something eerie. And, in some cases, I can share insights about how to increase the chances of it happening, with specific triggers. That’s not just about objects, but also about the kind of person (or his/her demeanor) that seems to make a difference. Author Fiona BroomePosted on June 18, 2018 Categories BlogTags VideosLeave a comment on Why Paranormal Research? This week, Mark – a friend and visitor to my ghost hunting site, HollowHill.com – posted a comment about a recent report in the American Psychological Association’ academic journal. The Daily Grail summarized the report and some of its implications, in The Reality of Psi: Leading Journal Publishes a Paper Revealing for Superpowers of the Mind. Here’s the opening of that article. 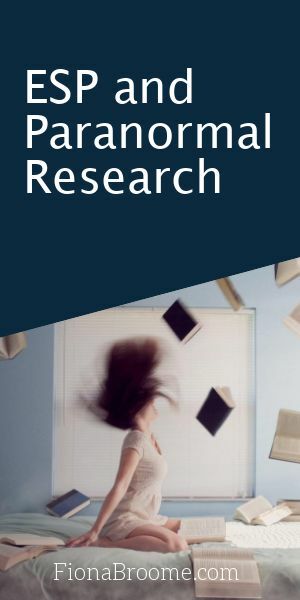 The new paper – “The experimental evidence for parapsychological phenomena: a review“, by Etzel Cardeña of Lund University – also discusses recent theories from physics and psychology “that present psi phenomena as at least plausible”, and concludes with recommendations for further progress in the field. The abstract of that paper summarized a dilemma many paranormal researchers deal with, daily. Of course, that’s been a long-time issue: Arguing against closed minds that reject our “what if?” musings as contrary to common sense. Worse, those critics seem to portray our questions as assertions, when we’re simply trying to open the door to scientific investigations. But now, papers like Cardeña’s provide support. We can point to that research and repeat what we’ve been saying since at least the 19th century: Let’s explore these topics to find the real answers. Right now, my favorite quote is, “The important thing is not to stop questioning.” That’s something Albert Einstein said. I feel as if we’ve waited a long time for this door to be opened, even a sliver. Yes, it’s just one paper, but it’s a significant step forward. Photo credit: Marko Blazevic for Unsplash. Fiona Broome Proudly powered by WordPress	/ The owner of this website is a participant in the Amazon Services LLC Associates Program, an affiliate advertising program designed to provide a means for sites to earn advertising fees by advertising and linking to Amazon properties including, but not limited to, Amazon.com.